When Amazon launched Voiceview for Kindle on Tuesday, they announced it with a $140 Kindle Paperwhite bundle and the promise that the feature would be coming to other Kindle models eventually. 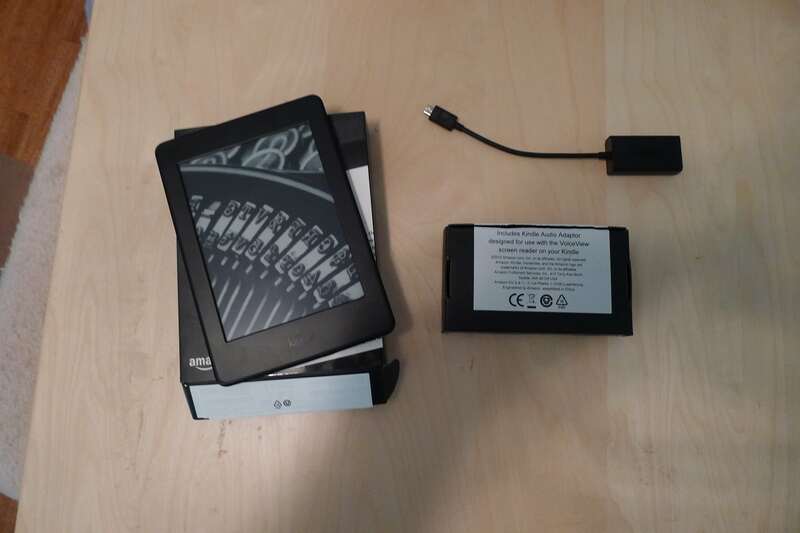 My loaner review unit arrived on Thursday morning, and the first thing I did after taking a few unboxing photos was to plug the Kindle audio adapter into my Kindle Oasis (also a loaned review unit). Voiceview for Kindle started working on my Oasis as soon as I plugged in the adapter into the Oasis's USB port. The Kindle started reading the menus to me aloud (via earbuds) and explained how to use the new feature. This feature also works on the Kindle Voyage, although some additional steps are required. Also, you will need to supply your own headphones, earbuds, etc. They're not included. You can double tap to select a menu item, or use one of a limited number of gestures, and you can disable Voiceview for Kindle simply by unplugging the audio adapter from your Kindle. You can also disable the feature by removing the Kindle Oasis cover (I found this out the hard way). In VoiceView settings you can toggle VoiceView On and Off, engage a Tutorial, adjust Reading Speed (from .66x to 4x with 8 intermediate speeds), and Volume (from 1 to 8, default is 4). Voiceview for Kindle works with the dictionary, Wikipedia, and translation feature (although they are rather hard to navigate). It does not work with the Kindle's web browser, Kindle Freetime, or audiobooks, and there's no obvious option for changing the voice's speed. But it is simple to use and the hardware is equally simple. I now have two reports which confirm that the Kindle audio adapter is a generic USB to audio converter which works with any headphones, earbuds, or speakers. Amazon charges $20 for it, but you can put together your own unit for less than ten dollars on Ebay. The only limitation is that the voice is currently limited to English, and you might need to install the voice file. The Kindle Voyage, for example, does not have the voice. Also, at least one 7th-gen Kindle Paperwhite in Germany does not have the voice (probably because the Voiceview for Kindle has not officially launched in Germany). But it does have the software, and you can download the voices separately (from this page on Amazon.com). All in all, Voiceview for Kindle still needs some work. It's not as intuitive as it could be, but I still feel Amazon has managed to over-deliver a feature which is not available on any other current ereader. Any word on it working with the basic Kindle? That would be very useful to institutions. After all, if you can’t see the screen, why pay for backlighting? I don’t have one to test. But I can add that it doesn’t work on the older KPW. The software isn’t there. It does not work, even with voice files. It may lack software, or it may lack the hardware support. If the latter is the case then we may have to look for the replacement that is thought to be coming in the next few months. Does it read Kindle books? It will read the text in an ebook, yes. It’s intuitive if you are used to using screen readers for iOS or Android. It’s actually a bit easier to use, by comparison, because unlike those devices, most of the Kindle functionality is accessible, whereas most iOS and Android apps are not. There were reports they were working with the group that was previously suing them to add the features, and it shows. It works really well, and far better than the Kindle Keyboard did. Quite a bit of the basic reading functionality is accessible, including dictionary lookup, Xray, Go To, Bookmarks, and Display Settings. As for what is not accessible, there is some inconsistency. Some items are voice-tagged as ‘unavailable’, and you cannot interact with the feature with VV enabled. That’s fine. But then there are things that are not voice-tagged as unavailable, but when you go there, you discover they are not ‘accessible’. In principle, I think most of this other stuff could be made accessible with a future update, but it is a good start. What I would like is a way to toggle VV on and off without having to find the switch in VoiceView Settings. Some magic gesture. On iOS you can configure triple tap home button to do this. A slight correction: it does not work with Wikipedia and Translate. You can navigate to the panels but VoiceView will not read the contents, and you cannot invoke Translate. It will read out the Dictionary panel. It works with books that have TTS disabled by the publisher. That is consistent with Amazon’s practice: if you have system level Accessibility turned on, text will be read out. I don’t remember how it happened but I had my Paperwhite lock up once and had to restart. So there are some bugs to squash. I got parts from Fry’s for about $15. I’m sure you could find the same on Amazon.com for that or less. That is an important distinction, thanks. Except I am pretty sure I got it to read the dictionary and Wikipedia cards. Let me go double check. Edit: Yes, it read the definition, and the Wiki entry. It stumbled over the pronunciations, though. My brother has a kindle Oasis and I wanted to read some books on it. since I’m visually impaired, I tried the solution mentioned here but the device keeps telling me that IT couldn’t find the voice file. I have download the file and put it in kindle’s directory, restarted my kindle and still the same error. further update: I’ve found a link for voice files for kindle 8th generation, but that also will not work. It’s very frustrating, but I think the Oasis lacks a feature that all the cheaper models have. this is the link for the newer voice file. Just did this to my Voyage, working like a charm…took longer to dig out my otg cable & sound adapter…thanks for the info!